Important stuff to know from the previous half of Supergirl’s third season: Kara made a new instant BFF in Sam, who has a daughter named Ruby and is nice, I guess? This show’s not the best at developing character relationships. Anyway, Kara’s also been struggling with her connection to humanity, brought about by the ultra-tragic breakup she had with Mon-El, a humanoid simulacrum made from saltine dust and Pantone’s full spectrum of beige hues. The human/alien dichotomy is the closest the season gets to a truly interesting idea, but it only glances off the surface before falling back into more standard villain-of-the-week fare mixed up with the aforementioned fumbled relationship development. Episodes just before the winter hiatus graced us with the return of Mon-El, blander than ever and married to an equally bland woman from the future whose name I find physically impossible to remember for longer than fifteen seconds. In addition to this, new BFF Sam has claimed her evil Kryptonian birthright and has become Reign, a Worldkiller bent on dispensing justice and cleansing the Earth. It’s been a few days in-universe since Reign won her fight against Supergirl, and Kara’s been in a coma the whole time. We get this news via a new character, Brainiac 5, who is able to enter Kara’s dream state (which looks like her apartment) and guide her toward awareness. This episode is called “Legion of Super-Heroes,” but Brainiac 5 is literally the only new member of the Legion we’re introduced to, so clearly Supergirl has no idea what the word “legion” means. While Kara is stuck in her own head and her body is stuck in a healing pod, Reign is reigning over National City. Although the characters hint that she’d been lying low a bit after the fight, she makes a pretty spectacular re-emergence by foiling a robbery and dumping the would-be thief's unconscious body in the middle of the CatCo office. She tells one of the nearby reporters to start broadcasting, then declares her mission statement to cleanse the Earth of villainy and apathy alike on live TV. “Apathy is the greatest sin of all” isn’t terrible maxim, exactly, but Reign is using a violent totalitarianism approach to dispensing justice, which isn’t great for National City. But she is, strangely, dispensing justice. She clearly knows the difference between right and wrong, even if that perspective is overly strict, since she targets a thief and a prison as her first examples. Is this the intended mission of a Worldkiller? The previous episode implied less actual justice and a more wholesale burning Earth to the ground, but now we’re getting a mission of righteousness — violent righteousness, yes, but still righteousness. Also of confusing note: Sam still exists. We see her playing with Ruby at the beginning of the episode, before she’s called to Worldkiller business. Again, the continued awareness of Sam wasn’t clarified in the previous episode and it isn’t exactly clarified now, either. Does the Evil Fortress of Solitude AI get to decide when Sam turns into Reign? In the previous episode she seemed pretty unambiguously against Sam returning to her normal life as Ruby’s mother, so once the Reign powers took hold, why did she let Sam go back? Does Sam remember anything about being Reign or finding the Fortress or talking to the AI? How does she brush away what has to be a good handful of hours where, presumably, her memories are just blank? See, these questions could have been answered over a longer period of time, but Supergirl decided to cram absolutely everything, from the introduction of Sam to the introduction of her Reign alter-ego, into ten episodes. The result is a plot that grows more and more holes the more you think about it. And no, most viewers probably aren’t dissecting episodes of Supergirl like I — a person who writes a weekly review of the show — might, but there is probably a subconscious awareness of things not lining up or being obviously glanced over, even for the most passive viewers. Back in her mind-apartment, Brainiac 5 declares Kara physically healed enough to wake up and resume her normal life, but when she tries opening the door, which symbolizes waking, she’s unable to do so. Kara freaks out, trying to use her Kryptonian strength and powers against the door, but it doesn’t budge and she can’t figure out why her brain seems to have locked her inside itself. And in the waking world, Brainiac 5 informs Kara’s friends and family that she’s for real locked in there, and he — a super intelligent robo-person — can’t decisively say why. Meanwhile, Reign’s been making quick work of wrongdoers in National City, destroying a meth house and targeting a prison. Her approach to justice is a tad imprecise, which means that the inmates of the prison and all the guards are in trouble. After a failed attempt to stop one of Reign’s attacks led to Alex breaking her tibia and the realization that kryptonite is not nearly as potent on Worldkillers as they would hope, the city and the DEO could really use a Supergirl. While Kara is cleaning up after her temper tantrum, she finds a picture of herself holding a pet cat named Streaky. Reminiscing about the stray cat, Kara tells Brainiac 5 about how she used to slowly work up the courage to pet Streaky, waiting until she knew she could be careful enough to touch him, and how his acceptance of her made her feel human and at home on Earth. From the Streaky story, we learn Kara’s careful approach to being gentle, clearly a parallel with her learning to fit in on Earth with all those fragile humans. Once again, the human/alien dichotomy returns, perhaps in its most fully-formed capacity. Kara realizes that the safe space her subconscious dropped her into was not some Kryptonian Fortress of Solitude, but the comfortable loft of Kara Danvers, where she is surrounded by Kara’s things and Kara’s important memories about stray cats with terrible names. This realization tells her that her humanity is just as much a part of her as her Kryptonian nature, and it’s not the sheer strength and abilities of Supergirl that allows Kara to escape from her coma, but a normal, human key. Like with Streaky the Cat, gentleness grants Kara freedom and self-assuredness. Kara has accepted the human side of her nature and wakes up from her coma, but she still has business to do as Supergirl. She goes off to fight Reign. The Legion of Superheroes has already prepared for battle, but they’re no match against a Kryptonian Worldkiller because — I must emphasize — there are only three of them and that is not a freaking legion. Kara puts the DEO plan to inject Reign with kryptonite in action, getting the jump on her and stabbing some krypto-goo directly into her jugular. Gross. Reign still escapes, though, and she just shakes off the effects of the kryptonite... so that was kinda pointless. Back in her Fortress of Eviltude, Reign meets up with the Evil AI and — oh look! She brought a friend! It’s that Rao cult leader guy from a few episodes back, whom she freed (unintentionally?) during her attack on the prison. He’s her new devoted follower. Why would Reign care, exactly? She’s been doing fine on her own without some nutbar cult leader hanging around. But it doesn’t really matter, since more Worldkillers are coming! Hurray! I can’t yet tell if Brainiac 5 is endearing or annoying. “I thought you were dead.” “I got better.” Very Monty Python and the Holy Grail of you, Kara. 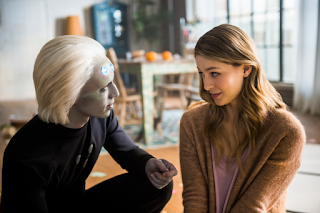 I’m sure Melissa Benoist was having fun imitating David Harewood's J'onn J'onzz, but that scene made Lena look like a complete idiot so I’m not fond of it. Isn’t Lena supposed to be a genius? P.S. the Legion of Super-Heroes hid the secret to stopping the onslaught of world-ending aliens called the Blight in their DNA and that’s very important, but it still doesn’t explain why the episode is named after them.